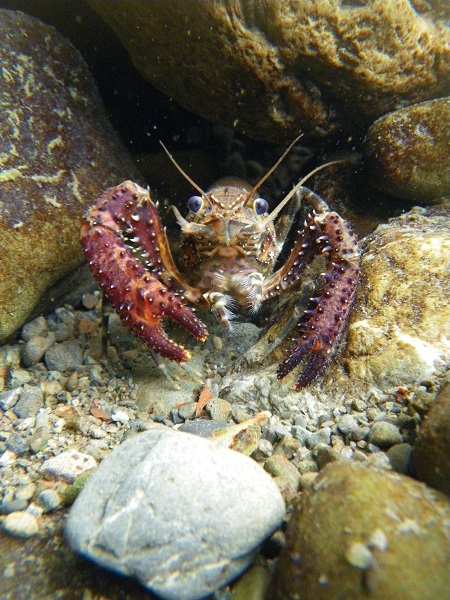 This winter, in a cold, clear stream near you, a certain freshwater crustacean has a heavy load to carry. 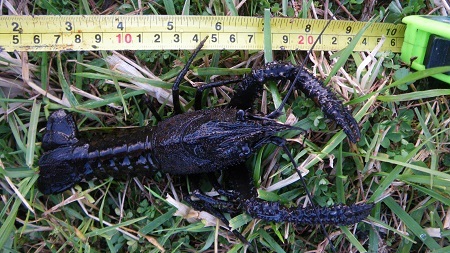 The female New Zealand freshwater crayfish, or kōura, spends the winter months carrying large eggs (up to 200 of them!) attached to the underside of her abdomen. The eggs hatch after 3 or 4 months, but motherhood doesn’t end there for the female kōura – the tiny babies (miniature replicas of their parents) hang on to their mother and she carries them everywhere she goes until they are around 4 mm long, at which point they let go of mum and head off to seek their aquatic fortunes. There are two species of kōura in New Zealand (loosely divided into North and South Island species) and both are found nowhere else in the world. They live concealed under rocks in small streams with clean water and have a remarkable ability to completely re-grow any limbs that are lost in accidents, near-misses with predators or in disputes with fellow kōura! Most kōura are greenish-brown in colour and often have beautiful patterns on their backs, however colours can vary – bright orange and blue ones have even been found! Kōura used to be common throughout New Zealand waterways but habitat destruction, pollution and introduced fish such as trout (for which kōura make a tasty meal!) have heavily impacted populations and they are now a threatened species. Kōura hiding amongst rocks (Photo: Alton Perrie). Amber McEwan is a freshwater ecologist based in the Wairarapa. I would love a better understanding of what the pollution is that affects Koura. The most recent published Journal of the NRWQN data shows many of our native forest waters are heavily polluted in relation to the drinking water standards. In particular Ecoli and Phosphates as well as clarity, seem to be high relative to the standards. I have to assume Koura are reasonably tolerant of these as they occur at high levels in Native areas. What is it that they are not tolerant of in modified creeks? Or are our native areas declining too? Sounds like the question would make in interesting research project. The analysis by Larned etal. (2004) shows about 50% monitored native forest tributaries breach the drinking water levels for phosphate (DRP). Over 75% breach for clarity, and about 75% for ecoli. My point being if we are using our drinking water standards as a measure of pollution our native areas are not all that pristine. Are our Koura quite tolerant of pollution? Or are there pollutants not typically monitored that affect them? Perhaps Nitrate which has historically (recently) risen is a problem, perhaps it is roundup, or chlorine? Do we know? If I am going to be cynical I might say: Does anyone know? Are we just blaming pollution without having any direct evidence to blame pollution? Just some anecdotal evidence of one going up while the other goes down? Given our natural environment has a high measure of things such as ecoli, DRP and clarity relative to the National drinking standards (ANZECC & ARMCANZ (2000)) is the water standard a good measure of pollution. Eg For clarity our national standards indicate around 50% of pastoral and urban waterways are polluted. But because our natural areas are worse should we actually consider them pristine for clarity? I wonder if we need a pollution index, where we compare modified areas relative to the native areas rather then a drinking water standard? Otherwise aren’t we being too tough? Am I creating a topic that would be good for an Author? I’m not the most knowledgeable on these points, so I’ll see if I can find someone else to weigh in. In the mean time, I am pretty sure that koura are not as sensitive to N and P as they are to excess sediment. In fact, most NZ aquatic fauna are more tolerant of nutrient pollution than the introduced salmon and trout. So two points I want to stress are that it’s not all about pollution – habitat loss and predation are also really important factors – and that different species have different tolerances to any one stressor, pollution included. As such, human guidelines for water quality can’t be used to assess aquatic fauna sensitivities. As for what is the best way to define “polluted”, I wouldn’t be able to weigh in. If there is enough support, I’d like to convene a series on water quality (like the wetlands and governance series), so cross your fingers. It’s a murky topic. Sorry. Daniel – Not David. Speaking from my own point of view. Yes I would love a water quality series. The Southland region has been measuring either static or improving levels of most ‘pollutants’. Nitrogen has been labelled as the elephant in the room- as it has still been increasing. To me this is great news. We have most issues sorted and can now focus on N. In my experience the public perception is quite different to mine. Many think the world is ending or at least waterways are unbelievably polluted and getting worse. I read a lot of the info on water quality and I either have it wrong or the media and council have a lot to answer for. There seems to be a lack of balance with the focus on problems rather than the great gains made. Whilst solutions to nitrate issues need to be found locally, it is a people issue and recognising gains that have cost major investment, engages the public. Sorry for the deviation Amber. This information helped my understanding.